I need to mosaic a couple of images (satellite, 0.5*0.5 m high resolution). After mosaicking, I will do rectification using my own GCP from the field. For the example, I have image 1 and image 2, I want to put image 2 to covering cloud area in image 1 (logically image 1 has a bigger area than 2). My Question 1: What is the best solution, should I choose option #1 = doing "image to image" correction from image 2 to image 1, then do mosaicking and after that geometric correction or option #2 = doing geometric correction first for each image using my own GCP then do the mosaic process. Which one has the best result? My Question 2: If I choose option #1, a new problem occurs. When I want to align visually both images I get high RSME on the table (which is my client want low RSME), but if I stay with low RSME I get a bad visual image, here is my screenshot when doing "image to image". I have been trying use less or many points from image 1 act like GCP for image 2 to do "image to image" correction, been trying all transformation (1st, sec, third polynomial, spline and others) but still can't get good visual and low RSME, does anyone know how to fix this? Moreover, if I choose option #2, which is a bad solution considering each image have a different distortion, is not it? The usual process is to rectify first then mosaic. This way, you will have 2 images that are registered to the same coordinate system and geometrically correct. Think of having two maps of the area in question with different scales; to create a mosaic of the the two maps requires that both maps be at the same scale so you can stitch them together. The process can be done by having one map registered and then using GCPs from the first map (and from the field) to register the second map. However, when talking about rectification, I understand it is orthorectification which involves the use of a DTM to correct for ground variations. This is in contrast to georeferencing or rubbersheeting such as what is done to a scanned paper map. Aerial or spaceborn images should be corrected for ground relief as they don't have a uniform scale due to the variations of the land topography, i.e. different elevations. Spaceborn imagery might also suffer more distortion within one image due to the acquisition angle which can be off nadir and the swath of the image. Anyway, the expected end result and the accepted error define the method to be used. Also, if the area of interest has little to no elevation variation, then a simple image georeferencing might be sufficient. I suggest you read about the orthorectification process to better understand what is at stake. 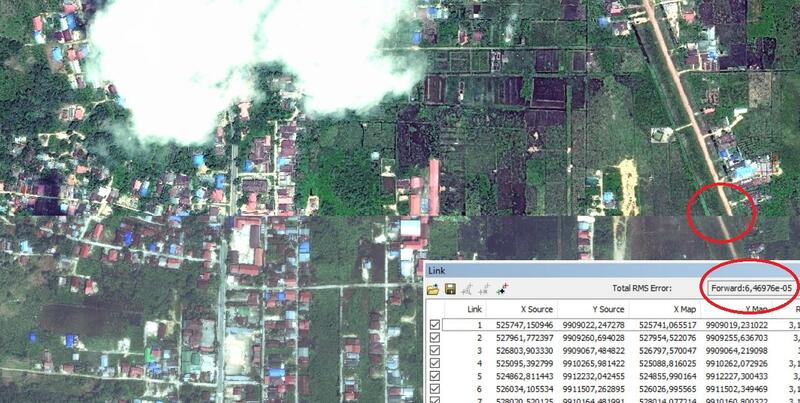 Software such as ERDAS Imagine or PCI Geomatica can orthorectify and create mosaics of imagery and importantly, can read the metadata of satellite images to produce properly rectified images. Not the answer you're looking for? Browse other questions tagged image-mosaic or ask your own question.